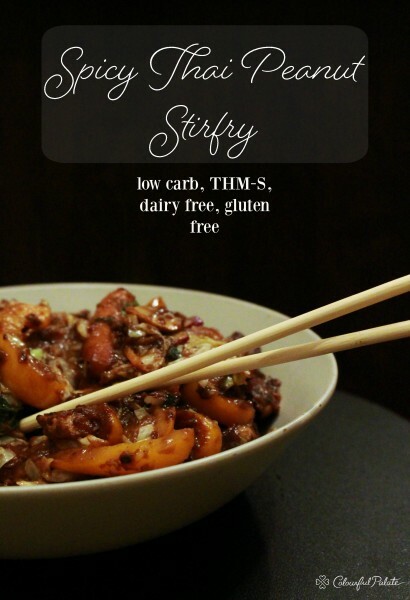 Spicy Thai Peanut Stir-Fry was posted on May 16th, 2016 and is filed under Dairy Free, Dips & Sauces, Gluten Free, Low Carb, Main Dishes, Protein, Recipes. This entry has 3 comments. You can follow any responses through the RSS 2.0 Comment Feed. I have discovered this little restaurant near my work place where they make THE BEST sauces with just the right amount of zingy spices. Just veggies and chicken cooked in a sauce that explodes in your mouth with flavour. I suppose it’s supposed to be ordered with rice, but I love a stir-fry as it is. Plus, then it’s low carb. It’s amazing…BUT it’s $16 for one small bowl. After further consideration, I decided I needed to cook at home and not spend so much money…sooo, here I am, presenting my most recent recipe for when I’m craving something saucy. I may have impressed myself. However, with the following recipe, if you like stir-frys over rice…by all means, cook some on the side. Or, if you’re carb conscious serve it over cauliflower “rice” (check out this recipe for an easy how-to). Alternatively, do as I do, and eat it straight. Thanks to Kraft Peanut Butter this Asian stir-fry had my tastebuds singing. I love the versatility of this Kraft Peanut Butter…smoothies, this easy muesli recipe, and hearty main dishes…basically…I really appreciate peanut butter. It can pretty much go in everything and bam…it turns into comfort food. It’s not just a spread, it’s an upgrade. Try making this with friends or family for a fun experience creating. This serves 2 hungry people. *I used spicy hummus for an extra kick. Directions: Add 1 tsp. sesame oil to a frying pan on medium heat. Add carrots and peppers. Once they are almost cooked, add kale, mushrooms and coleslaw mix to the pan. While that’s finishing cooking, make the sauce. Add a tablespoon of sesame oil to a frying pan on medium heat. Add ginger, garlic, and onions and cook until translucent and fragrant. Add peanut butter and sauté for few seconds. Add coconut milk, soy sauce, hummus, and chili spice. Cook by whisking it constantly. Taste and adjust as per taste and cook until it starts to thicken and the sauce coats the back of the spoon. You may need to add a little more coconut milk for the consistency you want. Add to veggies and stir in your cooked chicken. And done. Serve warm! Hope you love! Check out Stick Together for more easy and yummy recipes! You’ll quickly learn that with one jar you can find endless inspiration! 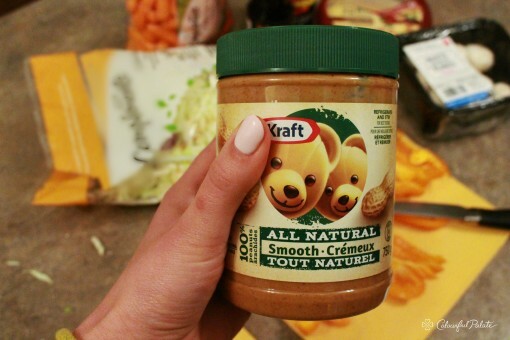 ANNNNND…don’t forget to enter the #KraftPeanutBetterIt contest below for a chance to win a grand prize – a $300 VISA gift card and yummy Kraft Peanut Butter products! Total value $500! Say whaaaaa! Let’s talk sauces…what’s your all-time favourite sauce? Have you ever had peanut butter in a main dish? Disclaimer: Although this post has been generously sponsored by Kraft Heinz Canada UCL, the opinions and language are my own. Sounds delish! You do make the most yummy recipes! This looks like it will fair well inside the collard greens wraps. I am excited to try this soon!